1. Preheat oven to 375°. Preheat oven-safe large nonstick skillet over medium-high heat 2 minutes. Add bacon and cook 10 minutes or until almost crisp, stirring occasionally. Meanwhile, in large bowl, whisk together eggs, milk, salt, pepper and nutmeg until well blended. With slotted spoon, transfer bacon to plate. Discard most bacon fat. 2. Into same skillet, add leek and bell pepper and cook over medium-high heat 3 minutes. Add 3/4 of bacon and cook 2 to 3 minutes or until leek is lightly browned, stirring frequently. With rubber spatula, stir in egg mixture and cheese; sprinkle remaining bacon on top. Place skillet in oven and bake 18 to 20 minutes or until center is set. Remove frittata from oven and let stand 5 minutes. Run rubber spatula around edge of pan to loosen. Cut into 8 equal wedges to serve. Place log of chèvre in freezer 10 minutes for easier crumbling. 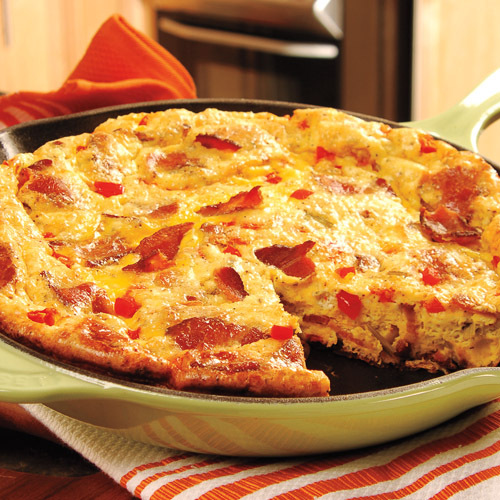 For a reduced-fat frittata, replace eggs with 3 cups egg substitute and use skim milk instead of whole milk.